Concrete may look like a boring and limited material, but in actual fact it’s extremely versatile. In addition to being used for large projects and buildings, it’s also used for smaller and more creative projects. The utilitarian reputation of concrete couldn’t be further from its actual potential, with a number of amazing DIY projects on offer that will allow you to be creative and add a personal touch to your home. 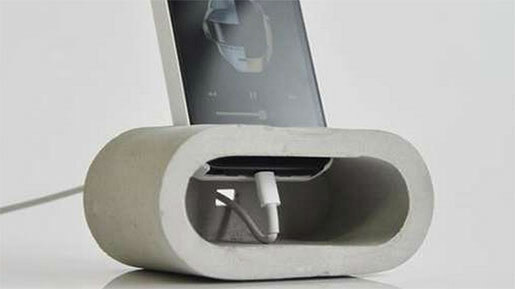 You can use concrete to create anything from homewares to home improvements. Concrete makes an excellent base for a modern take on the vase. It’s sturdy, industrial, and provides a modern element to any space. 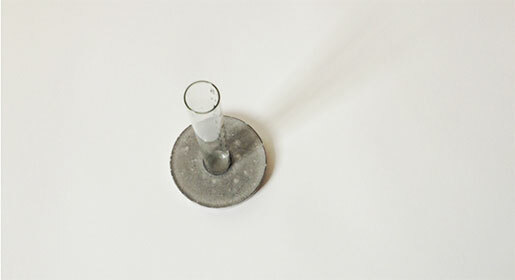 This project simply requires some fast drying cement, water, a mould, a mixing utensil, and a test tube or rain gauge. 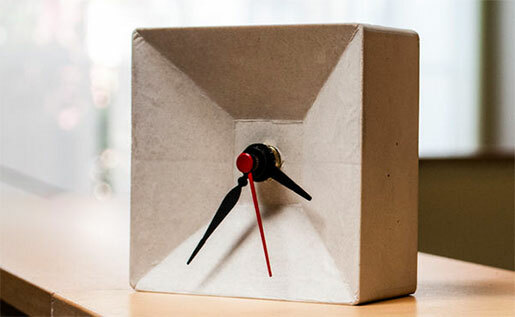 Why not make yourself a small clock out of concrete for a truly original timepiece? Or even use it as an interesting decorative component for your desk or bedside table. The composition of this clock is slightly more complicated than some other projects, but the process is relatively simple. Some concrete, foam, a clock kit, particle board, and screws is basically all that is required. The real challenge comes with assembly, but this is one that you’ll be proud of. 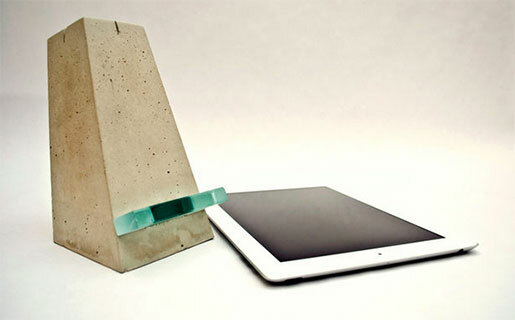 With so many accessories available for iPads and mobile devices, a concrete stand is an interesting project that will yield a result that most of your friends will not have seen before. A popcorn bucket provides the mould and some wood, and styrofoam and concrete are the main ingredients for this one of a kind piece. 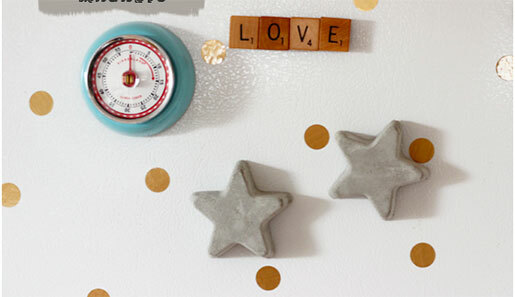 A truly simple yet interesting project, magnets are a great introduction to creating with concrete. All you need for this is some mould trays in any shape you desire, some concrete, and some small magnets. Add some new textures and a solid cutting surface to your kitchen accessories collection. 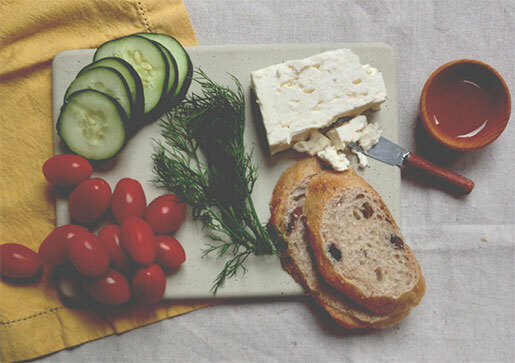 This chopping board is easy to make and will impress any house guest. It can also double up as a cheese board or serving board. 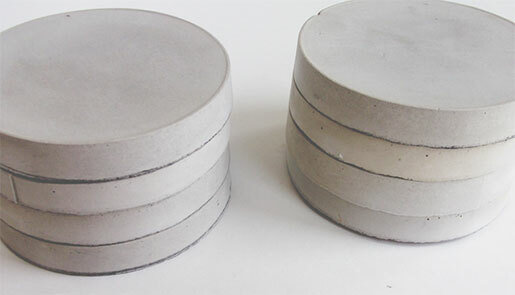 It’s as simple as obtaining some thin setting concrete, such as Rockite, and using a tray or Tupperware container as your mould. 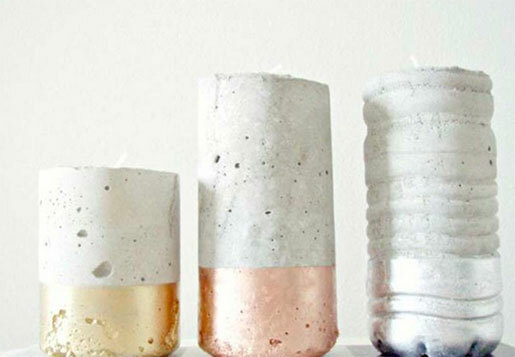 For a simple introduction to working with concrete, simply fill plastic bottles with cement to fill out a candle holder. Plastic bottles are the trick to creating cylindrical moulds, and the results are fantastic. Add some character to your garden with these concrete planters that can be used to create an elevated plant garden. 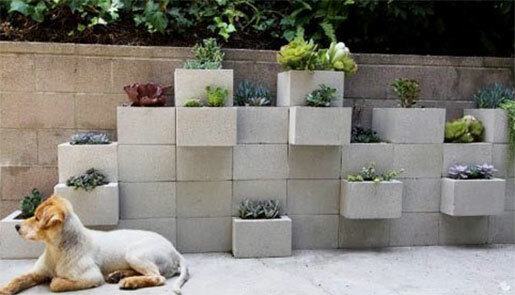 Cinder blocks create the perfect platform for planters, and they can be held together with liquid nails to create a sturdy, elevated structure. 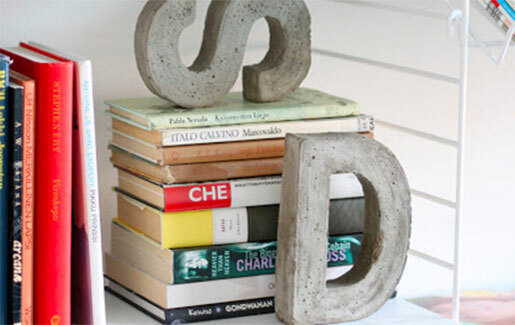 Add some personal and individual style to your bookshelf with these monogram bookends. One of the simplest concrete projects you can undertake, it involves modifying fibreboard letters to create a nice and easy mould to fill with concrete. For a rustic look and feel suitable for an outdoor area or even the bedroom, you can create your own concrete table. For a sturdy table, you’ll need to create a mould, perhaps using some shelving. This is the toughest part of this projects, but the results will be so striking it’s well worth the effort. Sturdy and contemporary, a concrete vase adds a modern and chic look to any room. When combined with a bright flower, the contrast is striking and can even be used as a feature piece. 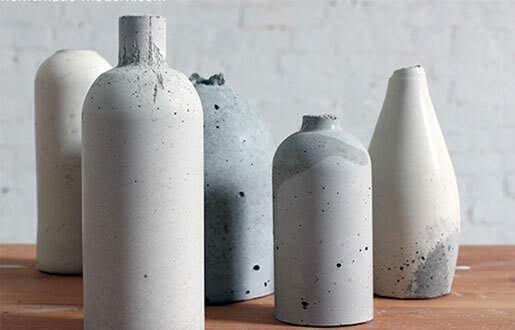 This is a particularly fun and creative little project that’s as simple as filling plastic bottles with concrete and then cutting open the bottles to reveal concrete vases. 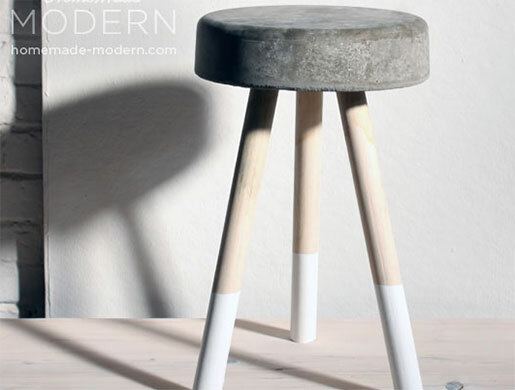 This stool looks like a designer piece, but it’s something you can make yourself quite easily. Use it indoors or outdoors, wherever it suits your decor. A little more involvement than some of the other projects, you’ll need to measure some things to ensure you end up with a geometrically correct stool – the seat is the easy part, using a bucket as your mould to form the shape. A more complex and time consuming project, this one is truly functional and provides a new take on the saturated iPhone and sound dock market. This is one for the more advanced or committed concrete artist, as the mould requires construction from scratch. The result, however, is not only striking but acoustically effective as the sound from the iPhone speaker is enhanced due to the design. Add some street appeal to your home’s front garden with this concrete house garden stepping stone. A creative way to number your home, it’ll be sure to grab attention. A reasonable amount of prep work is required for this one, so perhaps it’s a good one for the committed home improvement or landscaping enthusiast. Everyone needs coasters in their home, so why not make your own? Simple to make and striking in appearance, these are the perfect addition to a modern decor scheme. A simple yet nice industrially chic coaster is as easy as finding a circular mould that you like and using Rockite or similar concrete. 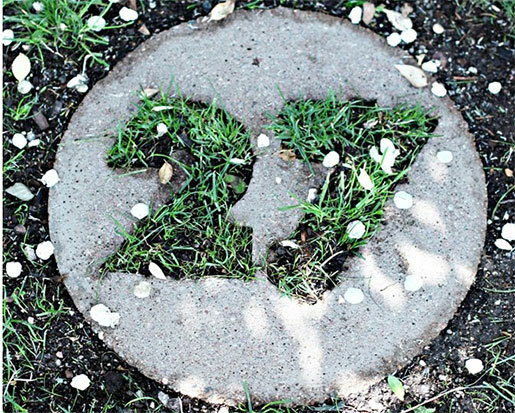 These are just some of the creative ways you can utilise concrete in DIY projects. 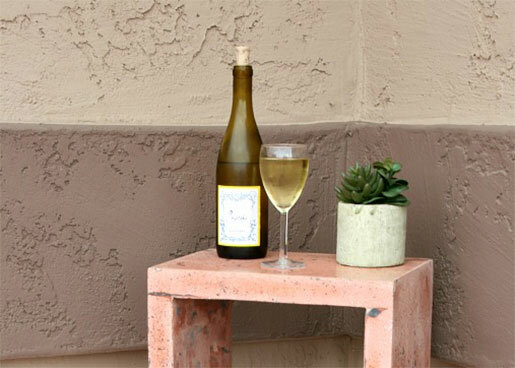 With a little practice, you’ll likely start to think of your own creative uses for concrete, proving that it truly is a versatile material, particularly with the current trend of industrial chic. Concrete crack repair that worked!